"Trapped in a crumbling city, surrounded by brain eating zombies... Can the gallant marines make it to the helipad for evac before they become lunch?" 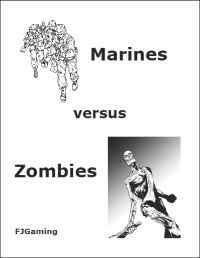 Marines versus Zombies is an exciting game for two or more players. A group of marines has been cut off from base and must struggle to find the helipad and escape. The map is constructed from 25 face-down tiles, randomly laid out in a 5x5 grid which allows for a unique game every time. Marines vs. Zombies is a 46 page book with everything you need to run complete games. This title was added to our catalog on June 15, 2004.